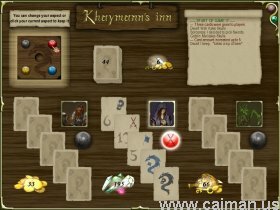 Caiman free games: Khaymann's Inn by ExC Games. 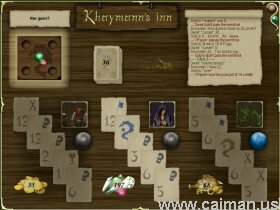 A very unique and beautiful fantasy-style casino card game. The main goal of the game is to get as much points in a particular chosen aspect as possible. Aspects are Skulls, Swords, Goblets and Flags. Each card has a number and a symbol of an aspect on it. There are also blank cards (0 points) and dragon cards (11 points in their aspect/ 8 points in other aspects). A card gives indicated number of points in it's aspect, and none in all the others.